Friends and family can contribute too! If you have suffered the loss of a pet, then you've come to the right place. An online memorial is a wonderful way to create a lasting tribute to your pet's life. Would you like your pet to be remembered for the joy and companionship that they brought to you and to your family & friends? Step through our simple question and answer wizard to create a personalized memorial for your pet. 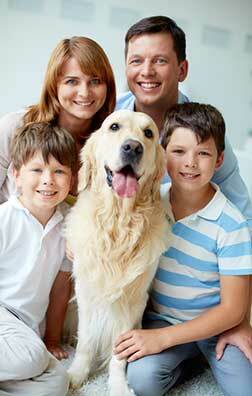 You can include photos, thoughts, memories, or anything else you'd like your pet to be remembered by. You can add text, graphics, and even audio and video. Based on a structure designed by you, visitors, friends and family members can contribute their own words, pictures, notes, comments and other parting sentiments about your pet's life. If you wish, you can even let visitors upload their own photos, audio clips, video clips, and other memorabilia. The whole process takes less than 20 minutes and we provide enough storage space for some pictures and several hundred words, and your memorial will remain online for 3 months, all for FREE. You can optionally buy more space or time at a nominal charge if you feel that this will benefit your memorial. Try it now. There is absolutely no commitment. Everyone working at ILovedMyPet.com is a pet owner and pet lover. This site was created as a genuine service for people who have loved and lost a pet, as we have. We have discovered that an online memorial is a wonderful way to help the grieving process and to create a lasting remembrance. Join the thousands of people who have already created online memorials using our service. Find out what our customers have to say. Read some testimonials.